The U.S. delegation delivers to North Korean Foreign Minister Ri Yong Ho a letter from President Trump to Kim Jong Un. Diplomats from the United States and North Korea alternately shook hands and lobbed critiques at one another Saturday, in what appeared to be another roadblock in the path to negotiations aimed at ending Pyongyang’s nuclear and missile programs. In a day of head-snapping twists of tone at the annual conference of the Association of Southeast Asian Nations (ASEAN) in Singapore, Secretary of State Mike Pompeo warned Russia not to help North Korea cheat on U.N. sanctions that Moscow had voted for. 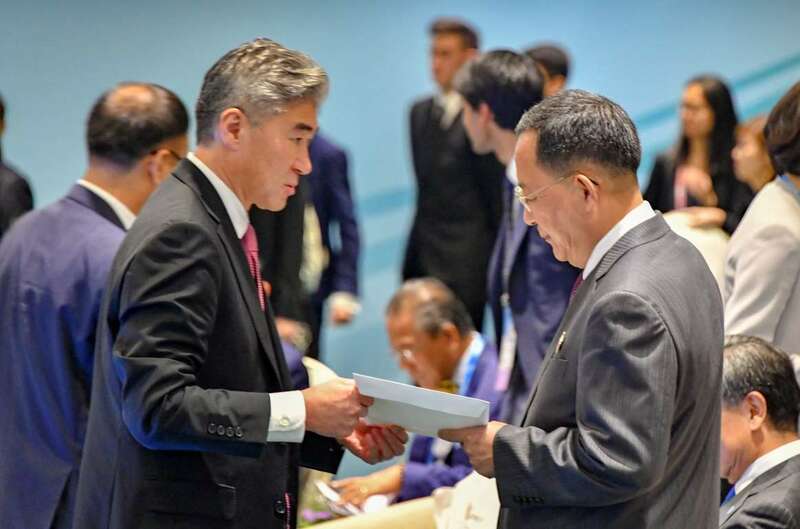 [post_ads]As the two top diplomats returned to their seats, Sung Kim, the U.S. ambassador to the Philippines, approached Ri and handed him a white envelope bearing a letter from President Trump to North Korean leader Kim Jong Un. But things at the Singapore conference went downhill after Pompeo departed for Indonesia: Ri waited until then to deliver a sharp attack on the United States in remarks at the forum. Though he said the North Korean government remains committed to a joint statement that followed a summit between Trump and Kim in June, Ri criticized the White House for insisting on maintaining sanctions until disarmament is complete and demanded “confidence-building” measures along the way. “What is alarming, however, is the insistent moves manifested within the U.S. to go back to the old, far from its leader’s intention,” Ri said. Previous negotiators have seen similar rapid-fire mood swings from Pyongyang. This is just North Korea’s style of negotiating and indicates any talks would probably take many months, if not years. Pompeo has acknowledged talks will be difficult and drawn out, but he said Saturday that he remains optimistic that eventually the two sides can reach a deal to end the North’s nuclear weapons program. Pyongyang’s willingness to truly denuclearize has come into question lately. A confidential report by the United Nations, shown to reporters Friday, says North Korea has violated numerous U.N. Security Council sanctions by continuing to develop its nuclear weapons and missile programs. Also last week came news reports that intelligence agencies believe the North is developing new missiles. Much of the discord stems from differences in how Washington and Pyongyang view the pace of rewards to North Korea if it proceeds dismantling its weapons programs. Pompeo has insisted that the United States expects total denuclearization and that sanctions will remain in place until the process is complete. North Korea, officially named the Democratic People’s Republic of Korea (DPRK), has demanded a phased approach, with sanctions eased in several steps as a show of goodwill. An administration official brushed off the remarks as growing pains in a still-developing relationship that has been wobbly at times. Pompeo used the ASEAN conference to hold meetings with diplomats from more than two dozen countries to urge their governments to keep up the economic pressure on Pyongyang until its nuclear weapons program is irreversibly dismantled. At a news conference, Pompeo noted reports that Russia was entering into joint ventures with companies in the North and granted new work permits to North Korean guest workers. He said the United States considers the reports, first published in the Wall Street Journal, to be accurate and as such would violate a U.N. Security Council resolution restricting trade with North Korea. Despite the carping, the tone was considered a major improvement over last year, when the buzz of the ASEAN meeting was whether Pompeo’s predecessor, Rex Tillerson, would even be in the same room with North Korea’s foreign minister. This year, in his first visit as secretary of state, Pompeo has been at the forefront of talks with North Korea aimed at its eventual denuclearization. That view seemed to be supported by a communique expected from the ASEAN diplomats, who, along with representatives of Japan and South Korea, urged Washington and Pyongyang to “continue working towards the realization of lasting peace and stability on a denuclearized Korean Peninsula,” according to a draft seen by the Associated Press. Earlier Saturday, Pompeo suggested that the timeline for denuclearization will be determined in large part by North Korea’s mercurial leader. Pompeo started the morning with a rosy tweet, saying he had had productive discussions on North Korea with Chinese Foreign Minister Wang Yi. China is responsible for the lion’s share of trade across North Korea’s border. Despite the United States’ growing trade war with China, there was a palpable sense of relief that the tensions of last year appeared to have eased considerably. Apart from urging continued support for being tough on Pyongyang, Pompeo’s three-day trip to Asia is part of a U.S. effort to boost trade ties with the region, despite the Trump administration’s withdrawal from the Trans-Pacific Partnership trade agreement.